I have been a pancake nut recently. Protein pancakes, that is. I feel like I'm eating dessert for breakfast, yet it's healthy, filling, and full of protein. Not to mention the options are endless! I'm going to share two recent concoctions with you, both amazing. Cinnabun and Carrot Cake. (OMG). Think you're too short on time to make them? If you can throw ingredients into a blender for a protein shake, this is just about as easy. A little more ingredients, and a few minutes on the griddle. 15 minutes tops. 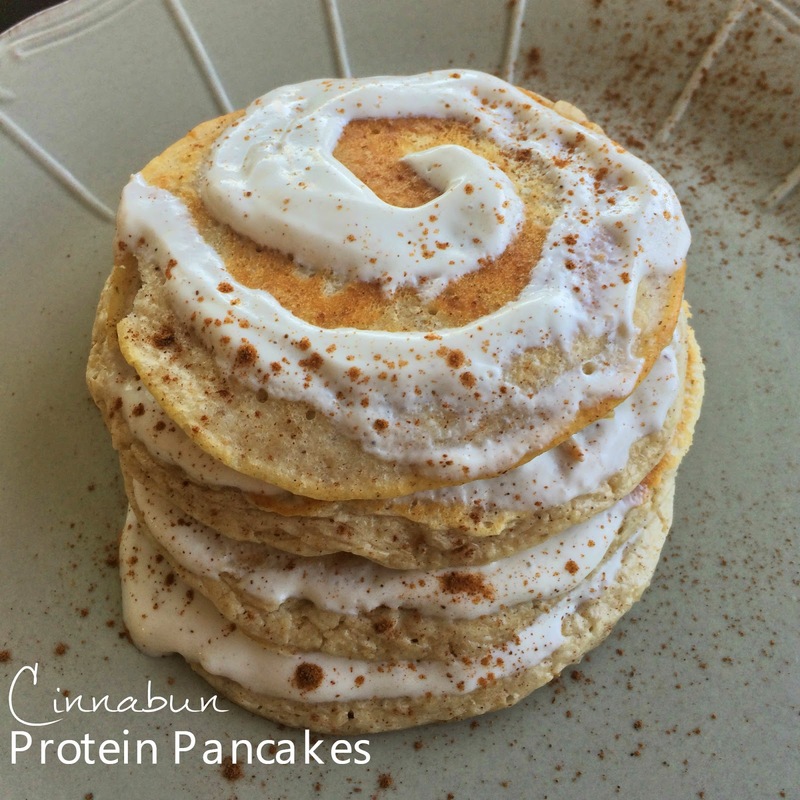 I'll start with the Cinnabun pancakes. You just add oats, Greek yogurt, egg whites, Cinnabun protein powder, baking powder, and almond milk to your blender. Then pour out 1/4 cup at a time onto a hot griddle. Combine all ingredients into a blender and blend until smooth. Add more milk depending on the consistency you want. You don't want super watery or the pancakes will spread and be odd-shaped and thin in the pan. Pour about 1/4 cup of batter onto medium heat greased griddle and cook for about 2-3 minutes until edges start to brown. Flip and cook another minute until done. Mix 1/4 cup of Greek yogurt with 1 Tbsp of real maple syrup and use as topping. Or use regular maple syrup or other topping of choice. Sprinkle with cinnamon as a garnish. These pancakes incorporate a veggie into the batter. How's that for healthy? Yet, they taste like heaven. Classic spicy carrot cake topped with a decadent (yet low fat) cream cheese icing. Check out those little carrots in there. And the dripping cream cheese icing... sigh. Whip softened cream cheese and maple syrup together until combined. Add milk to thin out if desired. Put all ingredients except optional into a blender and blend until smooth. Pulse in additional options if desired. Heat a non-stick skillet sprayed with cooking spray on medium heat. Pour 1/4 cup of batter per pancake onto the hot griddle and cook until edges start to brown and surface has bubbles. Flip and cook an additional 1-2 minutes until done. 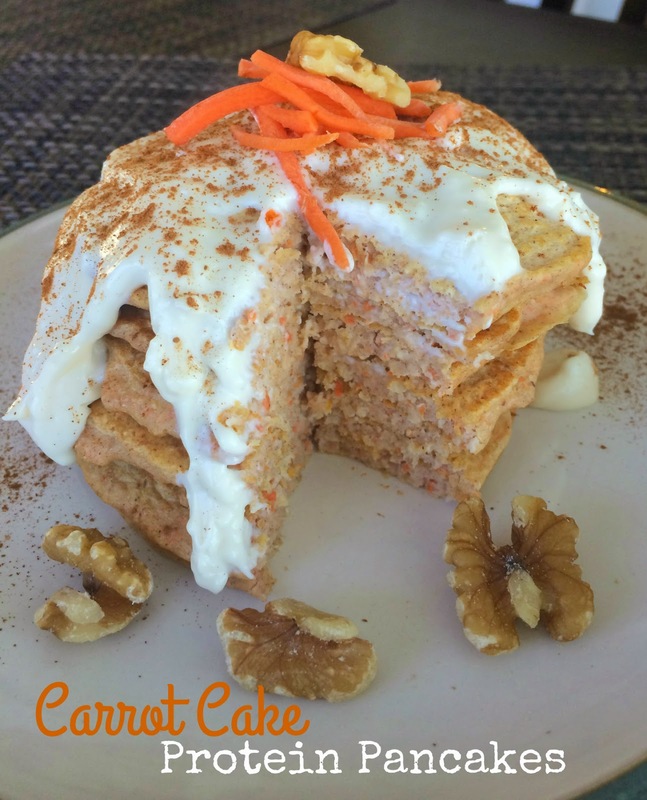 Drizzle with additional cream cheese icing, nuts, cinnamon, and carrots. Make these! You will not be disappointed. I made these pancakes and WOW! You know when you want to eat healthy but dont want the food to loose the flavor it would normally have? This solves that problem. Plus, who doesn't like Cinnabun!